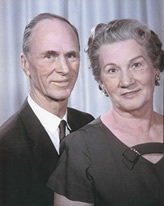 John Brandt and his wife Orah were community leaders in Nampa throughout their lives, actively supporting private and public education and other community endeavors with both financial contributions and commitment of their time. John Brandt farmed, taught school, developed a thriving real estate business, worked to bring businesses to Nampa, and, with his wife, pursued many philanthropic projects. Orah married John in 1931, and they shared 51 years together, raising three children. Also a teacher, Orah organized a group of ladies who canned and served food to provide free lunches in the schools. Like John, Orah was honored throughout her life for her community involvement. Both John and Orah had an abiding belief in the value and virtue of free enterprise, and they established the John H. and Orah I. Brandt Foundation to support those values in perpetuity. Don Brandt—Chairman of the Brandt Foundation board of trustees; son of John and Orah Brandt and President of the Brandt Agency, Nampa. Lawerance Gray—Long-time Nampa farmer, active in many community organizations. J.R. Schiller—Attorney and District and State Court Judge for many years. Jerry Hess (Emeritus Member)—Former Chairman of the Board of Trustees, College of Western Idaho; and President and CEO, J.M. Hess Construction. Contact: allendalton@boisestate.edu or (208) 426-3351.